California is experiencing another round of dangerous wildfires as generally dry conditions have prevailed so far this wet season, but the developing El Niño may be good news. Increasing drought has gripped California, helping to further fuel destructive wildfires across the state. But could the growing chance of an El Niño change that dry environment? Generally, El Niño years can mean more precipitation for the Golden State, but that might not necessarily be the case for all areas of California this wet season. Let's dive into the details for California and whether or not that expectation could become reality. Dry vegetation and low relative humidity combined with gusty winds to increase the fire risk in California this week, and although winds will decrease Friday into Saturday, this fire risk will continue into early next week. But the ingredients for this fire risk have been accumulating for months. A ridge of high pressure aloft or northward bulge in the jet stream has been in place over the West Coast recently which has pushed the track of storms farther north. As a result, generally dry conditions have prevailed in California. Upper-level weather pattern has resulted in a dry start to the wet season in California. The end result is a deepening drought. As of the latest update from the U.S. Drought Monitor, the entire state was experiencing at least abnormally dry conditions. This was a noticeable jump from the week before when 85 percent of the state was abnormally dry. Now, just over half of California is now in moderate drought. Abnormally dry and drought conditions have increased in California. 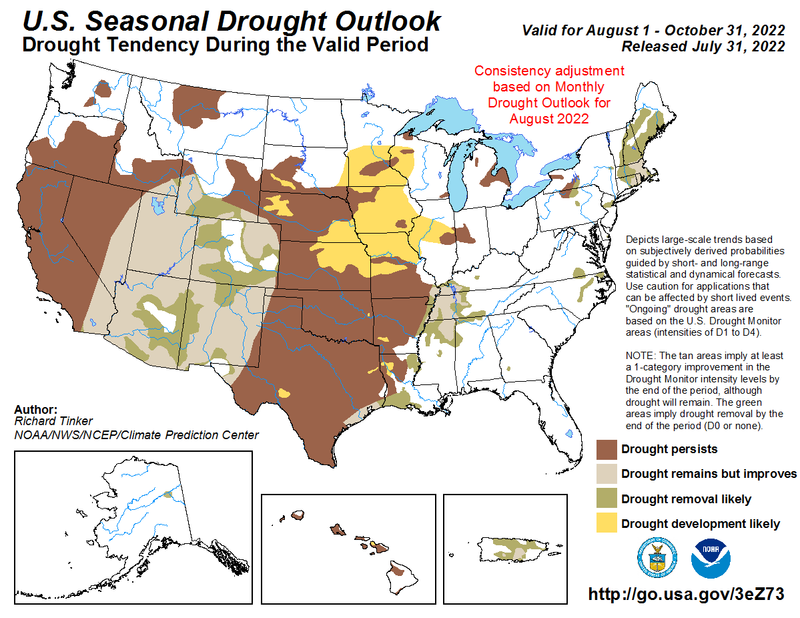 Portions of central and northern California have seen the greatest increase in dry conditions. This pattern is expected to remain in place through mid-November meaning no precipitation is anticipated in The Golden State over the next week. However, there may be some hope as we head into this winter, as a wetter pattern may develop which would lessen the fire risk. The precipitation outlook through January from NOAA indicates that most of California has an equal chance of seeing above-or-below-average precipitation. The exceptions to this are far northeastern California which has a higher chance of seeing drier-than-average conditions and southeastern parts of the state have a greater chance of experiencing above-average precipitation. The drought outlook from NOAA through January suggests that drought will likely persist in much of southern California, with far southeastern areas possibly seeing some improvement. Some areas of the Coastal Ranges in northern California are likely to see drought removal during this period. One important factor that may play a role in how much precipitation falls in California this winter is El Niño. As of early November, an El Niño watch remains in effect with an 80 percent chance of development this winter. As a reminder, El Niño refers to the warming of the equatorial eastern and central Pacific Ocean temperatures. Although El Niño conditions can bring above-average precipitation to California in the winter that is not always the case. A strong El Niño increases the chance of above-average precipitation in southern California, however, in the strongest El Niño on record, 2015-16, drier-than-average conditions were observed. Strong El Niño years also tend to see wetter conditions in northern California. The correlation in precipitation is less clear in weak to moderate El Niño events, but overall there is a slightly higher chance of above-average precipitation in California when El Niño conditions are in place. This would be good news given the recent dry pattern that has begun the wet season in California. The wet season begins Oct. 1 when moisture and precipitation increase in the region after a dry summer. Average monthly rainfall in Los Angles based on data from 1981-2010. Since Oct. 1, Sacramento has only measured 0.04 inches of rainfall which is 1.37 inches below average, as of Nov. 8. Downtown Los Angeles has received just over a half inch of rain this wet season but remains more than 6.5 inches below average year-to-date. A pattern change is expected to emerge later this month and the chance for precipitation may increase in California during Thanksgiving week.